Q: What Breed of Dog is Verdell? Q: What is Melvin's condition? Q: What is that song Vincent plays in Simon's studio? Really, how to make something original, fresh and odd out of absolutely nothing except a few characters? Using characters, only characters and nothing except characters. 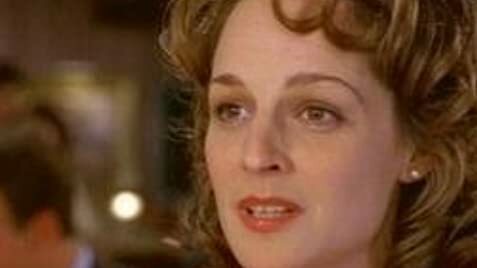 That's the simple formula Brooks uses in all of his work, but, for me, he has never created so much charm, warmth and sensibility as he did in `As good as it gets'. Characters write the screenplay in this movie, and everything that happens - happens because of what they are. They are nothing special  they are ordinary people we meet in the street every day and that have the same problems a lot of other people have. This movie presents the example of how much you can pull out of that. And if that is written as well as it is in this case, not even a happy ending can bother you. Because, in real life, shown here, what is the end? Everything is good and warm in this movie, everything is fresh and vivacious, understandable and well performed. 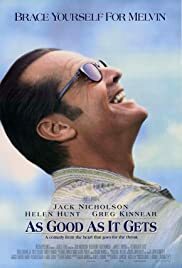 Jack Nicholson brings one of the best performances of his career, that terrific Helen Hunt finally got a chance to show how skilfully an actor can connect naturalism with the laws of the camera performance, and Greg Kinnear shows the most convincing emotions coming from a gay character I've ever seen. The relationships between the characters are created in the way that you can't predict anything that's going to happen, eventhough you know in advance what could come out of their mouth and what kind of attitude they'll have in a certain situation. You can simply feel the progressive collaboration that occurred between Brooks and the actors and the mutual understanding they developed, and it's not often that you see that kind of artistic superstructure shining on the screen so much as it does here. I find `As good as it gets' complexed, vital, intelligent, emotionally deep and studied, fresh, original, amusing, cheerful, funny, and one of the best films of 1997. 176 of 213 people found this review helpful. Was this review helpful to you?